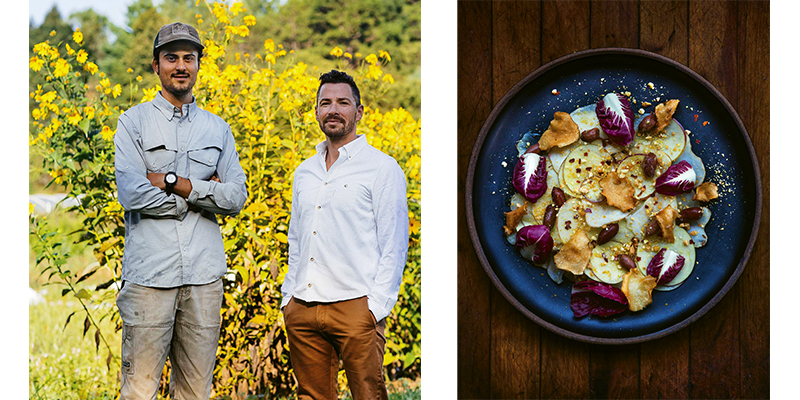 Sessoms (right) with Evan Chender of The Culinary Gardener, his sunchoke supplier; Table’s sunchoke salad is topped with slices of apple and raw sunchokes and boiled and roasted peanuts. “Sunchokes are like the new Brussels sprouts,” declares chef Jacob Sessoms as he fries up thin slices of this knobby root vegetable in the open kitchen of Table, his New American restaurant in downtown Asheville. Sunchokes are often called Jerusalem artichokes, but in fact, they are neither from Jerusalem nor a type of artichoke. The misnomer is believed to derive from the Italian word for sunflower, girasole, which sounds a bit like Jerusalem. Sunchokes, which are available year-round but peak in the fall and early spring, are indeed a member the sunflower family, and their edible tubers grow underground at the base of tall yellow flowers. The menu at Table changes frequently, and seasonal ingredients are at the heart of Sessoms’ creative process. His interest in agriculture was sparked as a student at Warren Wilson College in Swannanoa. From there, he attended the French Culinary Institute in New York City before opening Table in Asheville in 2005. He went on to become a James Beard Award semifinalist for Best Chef: Southeast in 2010. Sessoms has experimented with unusual ingredients like sunchokes throughout his journey as a chef, and they have appeared on Table’s late fall menus for more than a decade. He sources them from Evan Chender, aka The Culinary Gardner, in Weaverville, and alternates between hearty roasted sunchokes and refreshing salads that use sunchokes to accent other flavors. Sessoms says he appreciates the versatility of the vegetable. “With the skin on, they taste more earthy, and with the skin off, they tend to taste more nutty and rich,” he says. Sessoms has some advice for home cooks discovering sunchokes. First and foremost: Cook thoroughly. A few raw slices add crunch and flavor—like in his sunchoke salad with apples and peanuts—but a full serving of raw sunchokes can cause digestive distress because of the vegetable’s high levels of the carbohydrate inulin. For the faint of stomach, he suggests this recipe for sunchoke chamomile purée. He also appreciates simple preparations that let the vegetable express its true flavor. Butter, salt, and pepper are all you really need to let the culinary world’s latest celebrity vegetable shine. Do you miss being a chef in New York City? What do you cook for your family? What ingredient would you like to see on more local menus? What’s your favorite thing about living in WNC?